For Families, Teens, and Youth Groups! Creation Action Adventures are loaded with creation teaching and exciting recreational activities. They are designed to fortify and equip high school and college students to survive and thrive on the campus. Join experienced AOI creation teachers as they team up with Journey Quest Wilderness Ministry for a unique outdoor learning adventure. Experienced guides and instructors have a true heart for Christ and will encourage each person to build a deep and vibrant relationship with Jesus Christ! Raft and kayak Colorado’s most popular rafting/kayaking river, the Arkansas – famous for rapid after rapid of class 2, 3, 4, and 5 (optional) water! Also enjoy fun and challenging rock climbing, and hike in the beautiful Sangre de Cristo Mountains. Surrounded by the beauty of God’s world and built upon the strong foundation of God’s Word, this purposeful trip is a perfect way to be equipped to face the onslaught of naturalistic, evolutionary worldviews which saturate our society today. Students and adults will be challenged to grapple with tough issues and grow in their own relationship with God. They will be given tools to defend their faith, stand firm in the Truth of God’s Word, and impact others with boldness, gentleness, and confidence. Each morning begins with a time to be alone with Christ, followed by a hearty breakfast while you prepare for a packed day of fun and learning. Explore amazing geology and evidences for the Flood, marvel at the power of moving water, grapple with issues relating to the creation vs. evolution issue, and make new friends amidst an enjoyable and wild adventure. Evenings are spent together as we gather around the campfire to debrief, worship, and learn even more about God and how to firmly stand on His Word! End your day under the stars (or in a provided tent if you prefer) as the river lulls you to sleep. This week provides great fun, learning, adventure, and variety at a very reasonable cost. Three days on the river, one day rock climbing, one day hiking, plus delicious meals, transportation, most equipment, and teaching included. For the really adventuresome, choose an optional Saturday AM raft trip through the famous Royal Gorge with its Class 5 rapids (not for the timid!). Note: Participants will be expected to complete AOI’s Discover Creation DVD Series before the trip to provide common introductory background knowledge and help them get the most out of the on-site training. Monday: Ready, Set, … Raft! – Meet at 10:00 AM at Texas Creek, Journey Quest Headquarters (2.8 miles east of Cotopaxi, CO); Orientation, outfitting, lunch, and shuttle to put-in on the famous Arkansas River. 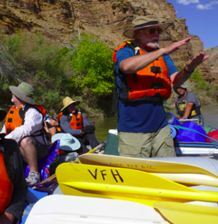 – Raft the gorgeous Brown’s Canyon through sections of beginner and intermediate rapids. – Enjoy the challenge and beautiful mountain scenery. Equipment and instruction provided. – More extreme fun! Lots of class 2-3 rapids in a beautiful section of Bighorn Sheep Canyon. – Beautiful and challenging hike in Colorado’s amazing Sangre de Cristo Mountains. – Enjoy some bigger class 3-4 rapids between Texas Creek and the take-out! – Take home your memories, insights, photos, and new friendships! Cost: $475 per person – Teens may participate without a parent on this trip. By phone: Please call 970-523-9943 or 1-800-377-1923.